Draft: 2015, Seattle Mariners, 5th rd. 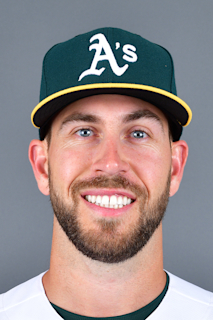 Graduated from Miramonte (CA) HS in 2012…Played three seasons at Stanford University (2013-15)…Originally selected by the San Francisco Giants in the 37th round of the 2012 First-Year Player draft, but did not sign…His brother, Brett, was a first round selection by the Chicago Cubs in the 2009 First-Year Player Draft out of the University of California Berkeley... Selected by the Seattle Mariners in the fifth round of the 2015 First-Year Player Draft and signed by scout Stacey Pettis. Named a MiLB.com Organization All-Star with Double-A Tulsa...Named a Texas League Mid-Season All-Star...Named the Texas League Player of the Week for the week on 5/13: .438 (7-for-16), 4-2B, 1 HR, 4 R, 5 RBI, 5 G...Reached base safely in 22 consecutive games (6/22-7/19), tied for 10th-longest streak in Texas League…Hit .324 (24-for-74) with three doubles, a triple, four home runs, 18 runs, and 11 RBI over that stretch...Hit safely in 15-consecutive home games from 6/22-8/14...Had a season-high 11-game hit streak from 4/6-4/22...Hit a career-high 15 home runs, matching his combined total from 2016 and 2017...Stole a team-high 22 bases; has stolen 16-or-more bases in each of his four professional seasons (106 total)...Recorded a season-high five RBI on 5/10 at Northwest Arkansas. April 13, 2019 Oklahoma City Dodgers activated SS Drew Jackson. April 10, 2019 SS Drew Jackson returned to Los Angeles Dodgers from Baltimore Orioles. April 10, 2019 SS Drew Jackson assigned to Oklahoma City Dodgers. April 5, 2019 Baltimore Orioles designated SS Drew Jackson for assignment. December 13, 2018 Philadelphia Phillies claimed SS Drew Jackson off waivers from Tulsa Drillers. December 13, 2018 Philadelphia Phillies traded SS Drew Jackson to Baltimore Orioles for Future Considerations. August 4, 2018 Tulsa Drillers activated 2B Drew Jackson from the 7-day disabled list. July 22, 2018 Tulsa Drillers placed 2B Drew Jackson on the 7-day disabled list. May 24, 2018 Tulsa Drillers activated 2B Drew Jackson from the 7-day disabled list. May 16, 2018 Tulsa Drillers placed 2B Drew Jackson on the 7-day disabled list retroactive to May 14, 2018. January 30, 2018 Los Angeles Dodgers invited non-roster SS Drew Jackson to spring training. August 1, 2017 2B Drew Jackson assigned to Tulsa Drillers from Rancho Cucamonga Quakes. June 24, 2017 sent SS Drew Jackson on a rehab assignment to AZL Dodgers. June 10, 2017 Rancho Cucamonga Quakes activated SS Drew Jackson from the 7-day disabled list. May 25, 2017 Rancho Cucamonga Quakes placed SS Drew Jackson on the 7-day disabled list. April 5, 2017 SS Drew Jackson assigned to Rancho Cucamonga Quakes. March 1, 2017 Los Angeles Dodgers traded RHP Chase De Jong to Seattle Mariners for RHP Aneurys Zabala and SS Drew Jackson. March 1, 2017 SS Drew Jackson assigned to Tulsa Drillers. February 25, 2017 SS Drew Jackson assigned to Seattle Mariners. April 5, 2016 Drew Jackson assigned to Bakersfield Blaze from Everett AquaSox. March 4, 2016 SS Drew Jackson assigned to Seattle Mariners. June 15, 2015 Seattle Mariners signed SS Drew Jackson. June 15, 2015 SS Drew Jackson assigned to Everett AquaSox.